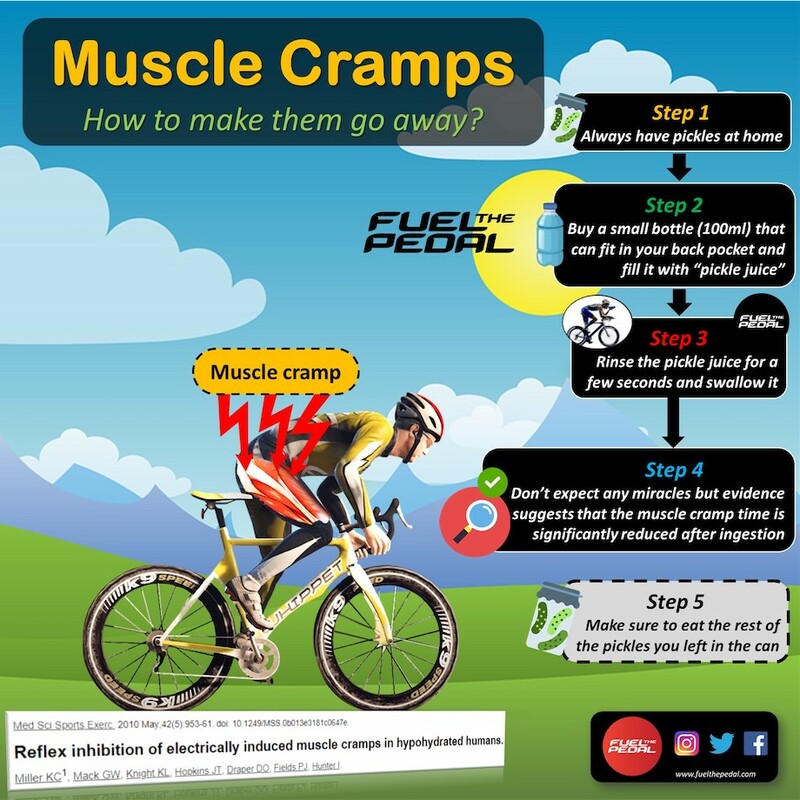 Toolbox: Skeletal muscle cramps are highly prevalent in endurance sports and often affect cyclists during racing events when the intensity of physical exertion is very high and the duration is long. But what causes them and how can pickle juice help relieve muscle cramps? Ouch! The dreaded muscle cramps! 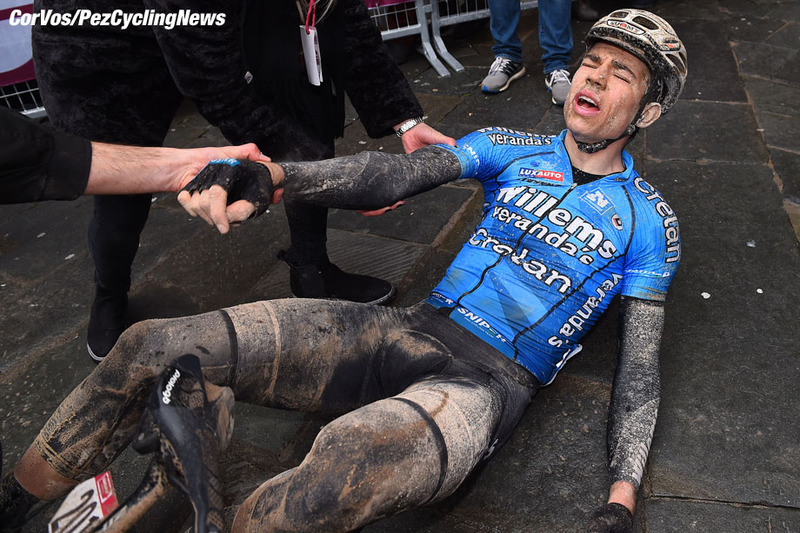 Most of us have experienced them at some particular moment of our lives, but especially for those of us who cycle and occasionally compete, a muscle cramp can make it impossible to maintain the effort and compromise a training session or end a race. Exercise associated muscle cramps can be defined as involuntary muscle contractions that can occur during or after exercise, usually in physically fit people, with no underlying disease, medical condition nor taking any medication. They can affect a variety of different muscles and can last up to 8h after exercise. It appears that if you have a previous history of muscle cramps, you’re also more likely to cramp during or shortly after exercise. You may often hear that muscle cramps are caused by dehydration, increased sodium losses with sweating or even that magnesium supplementation can in some way avoid them. However, it appears that neither of these scenarios are likely to have any effect of muscle cramping appearance during exercise. The proponents of the first theory defend that excessive sweating can lead to concomitant sodium, calcium, magnesium, chloride, and potassium deficits. In turn, this could ultimately impair neurotransmitter concentrations and lead to hyper excitability motor nerve contractions. However, this theory was based on observational case studies with no observed muscle cramping besides the apparent loss in electrolytes. 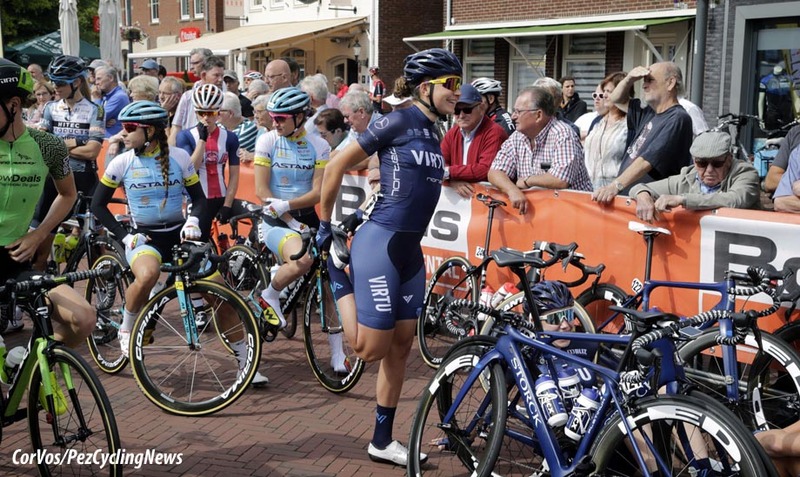 Additionally, cramping athletes often show similar pre- and post-race serum electrolyte concentrations and body weight changes when compared to non-cramping athletes. Even when intentionally dehydrating subjects at 3% or even at 5%, cramp susceptibility doesn’t seem to be increased, which may suggest that other mechanisms be responsible for the appearance of muscle cramping during exercise. This is where the altered neuromuscular control theory comes into play, suggesting that exercise-associated muscle cramping results from altered reflex control mechanisms in response to neuromuscular fatigue. Some supporting evidence is that this tends to happen most when we greatly exceed our current capacity, such as at the sharp end of really hard races. Although the most effective and instinctive treatment to relieve acute muscle cramping is to immediately stretch the affected muscle, there is another cost-effective strategy that might be worth considering, with science to back it up. Early observations on athletes ingesting small boluses of pickle juice attributed its positive effects to its high sodium and electrolyte content. This led Dr. Kevin Miller to research this subject, firstly showing that pickle juice ingestion didn’t cause any changes in plasma electrolyte concentrations, although it had a positive effect on reducing cramp duration time when compared to deionized water. For this experiment, the researchers electrically induced muscle cramping in the flexor halluces brevis (basically the muscle that flexes the big toe) on hypohydrated subjects (3% dehydration) followed by the ingestion of 1 mL/kg of pickle juice or deionized water. The results showed that pickle juice ingestion relieved a cramp in about 37% faster than deionized water and 45% faster than when no fluid was ingested. And guess what? Although it took 85 s for pickle juice to alleviate the muscle cramp, there was little impact on plasma electrolyte composition after 5 min, indicating that this rapid inhibition may be mediated by neutrally mediated reflexes in the oropharyngeal region, possible in response to the acidic reflex to the presence of vinegar. When we say juice, we don’t mean that you need to juice the poor pickles. The liquid used in the studies is basically the strained liquid from commercially available dill pickles. Subjects in Dr. Miller’s study ingested approximately 80 mL of pickle juice right after the appearance of the muscle cramp. The challenge here might be on transporting or having it available when the cramp occurs. Having some sort of travel-sized containers of 100 ml and filling them with pickle juice would probably be the best practical solution to transport them. Just be sure to preserve the opened jar in the fridge and to throw away the liquid from the container you didn’t use as it’s supposed to be refrigerated once opened. The main message here it should be that muscle cramping is multifactorial and therefore, there may be multiple causes for its appearance. Before trying any strategies such as pickle juice, you should keep a “cramp journal” so that anytime a muscle cramps occurs, you can register what happened that day that may have caused the muscle cramp. • Did you have a poor night of sleep? • Were you taking any medication? • Were you restricting carbohydrates? • Were you anxious or nervous because you’re racing? • Were the environmental conditions different on that day? This may allow you to firstly identify if there is a pattern every time you experience muscle cramping (e.g. getting muscle cramps every time you have a poor night of sleep). Only when you discard all of these factors, then you could consider trying pickle juice as a remedy for when the cramping decides to show up. Miller, K. C., Mack, G. W., Knight, K. L., Hopkins, J. T., Draper, D. O., Fields, P. J., & Hunter, I. (2010). Reflex inhibition of electrically induced muscle cramps in hypohydrated humans. Med Sci Sports Exerc, 42(5), 953-961. 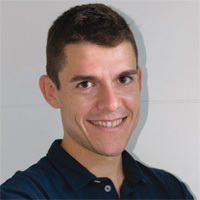 Gabriel Martins is a Portuguese Nutritionist with a Master's degree in Sports Nutrition. He currently lives in Spain where he works with cycling teams and integrates the research group on sports physiology at the University Camilo José Cela in Madrid. Additionally, Gabriel is the Host of Fuel the Pedal Podcast. A show where he interviews researchers, sports nutritionists and cyclists discussing topics related to nutrition and physiology. Gabriel can be reached for comments at [email protected]. You can also follow him on Instagram, Twitter and Facebook.